The Deckers section of the South Platte River is a fantastic tailwater fishery year-round. 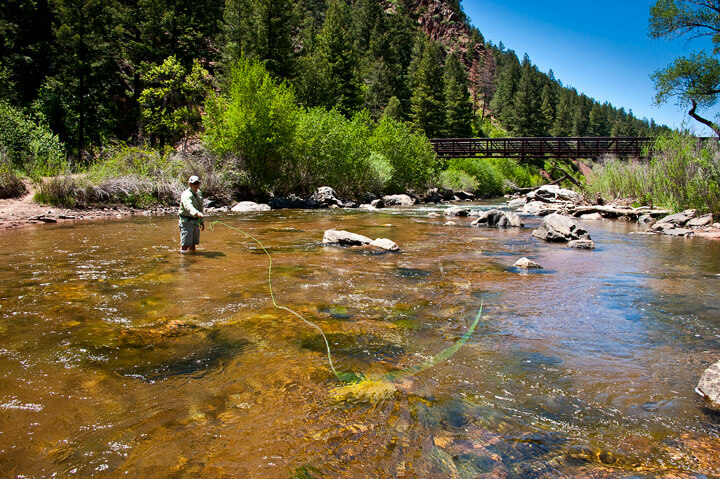 The 8 miles of deep pools, pocket water and riffles will challenge even the most accomplished anglers. Thanks to the Cheesman Reservoir with its bottom release, this tailwater is temperate all year around. We update our Deckers Fishing Report at least once a month. We try to keep it as up to date as possible. If you have questions, give us a call at any of our locations! Deckers is also just a few minutes from Denver, CO.
Want to Fish With us on the South Platte River in Deckers? Whewwww. I don’t know if you we’re at Decker this weekend but judging by the crowds on the river it seemed everyone in the Denver Metro area with a fly rod picked Deckers as the venue this Saturday and Sunday. The flows and fishing have been holding very consistently so we didn’t mind the extra company. With the flow holding at 120 the last few weeks the fish seem to have gotten savvy to the worm rig but we are still finding a few on the coffee and black Pat’s so that’s been my go to lead bug. As for the dropper we have been hammering ‘em on an Element Baetis in Lite olive but a tried and true Barr’s emerger bwo will do the trick as well. The surface activity in the afternoons is still super strong and we have been tricking fish on Parachute BWO and Extended body BWO dries as well as the baetis droppers in the film. Don’t let the crowds scare you, get out there and if you need to restock to flies or a new spool of fluoro you know where to find us.